Will We Ever Leave Jennifer Aniston Alone About Having a Baby? Good grief, this world is crazy. For approximately the 579th time since the public was first introduced to Jennifer Aniston in the mid- to late 80s, the media is speculating she’s pregnant. This woman has been causing tabloid feeding frenzies for over twenty years — basically since she began playing Rachel Green on Friends in 1994 — and there is nothing the world at large has wanted more than to have Aniston’s hair and body, and for her to have a baby. To be fair, the first two have been enviable throughout her career; the third is just plain weird. It never even seems to matter which date, boyfriend, lover, or husband was by Jen’s side, as long as she does her celebrity duty and gives us an appropriately named golden child. As of the past several years, even a lunchbaby will do. We, who cannot stop assaulting or killing each other for a single day hour minute a few seconds, have put Jennifer Aniston’s pregnancy at the top of all our newsworthy lists, right where the latest mass shooting was a day ago. In fact, if we’re to believe Facebook, the two subjects are equally worthy of our attention. I have a few favorite celebrities I’m guilty of following in the news obsessing over and Aniston isn’t one of them, but I am beginning to truly feel bad for her. Not many weeks go by that I don’t find myself face to face (not by choice) with tabloids in Target or a supermarket line shouting out her latest purported pregnancy. 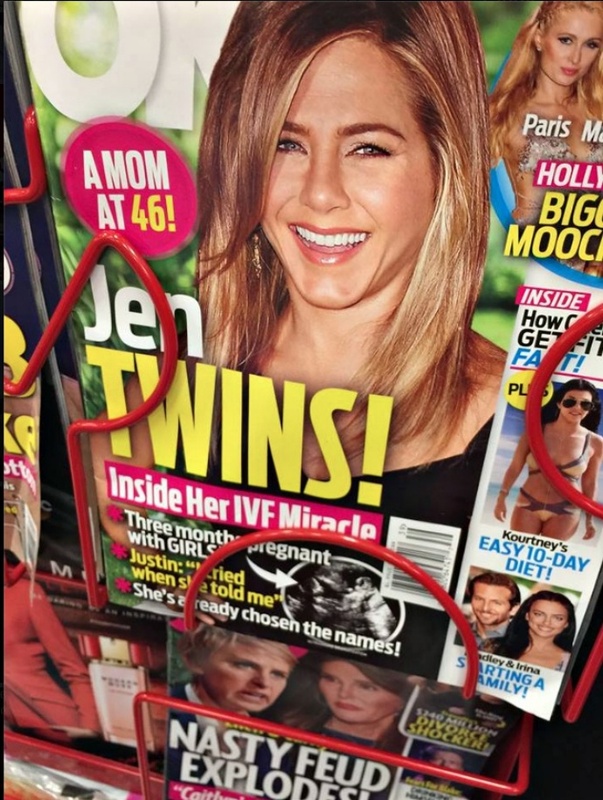 In fact, last September, I snapped this photo of one that claimed she was having twin girls, because, by now, even the idea of a single baby isn’t enough to make Jennifer a real person in the public’s eye. She is not pregnant. Shame on InTouch for making up the whole story, but this is not the first time they have done so. What you see is her having just enjoyed a delicious big lunch and her feeling safe on private property. Shame on them is right, and what about everyone who buys this trash, which pays the photographers who’ll do anything to get the shots, the people who write the bogus stories that go with those photos, and the editors who let them go to print? Isn’t it time to let Jennifer Aniston alone in her private life, at least to the extent of speculating over whether or not she’s pregnant any given week? She’s made it pretty clear that’s not her one true goal in life, and it really wouldn’t hurt a one of us if we just went on yakking about what dresses she wears to premieres or how her latest film is. I know it’s a strange time to focus on something seemingly so trivial, but, even as someone who often writes about or pokes fun at celebrities, I think this intense speculation over women’s bodies and something so personal as choosing to have children or not has reached maximum invasive saturation. I do believe celebrities make some trades in their lives for being famous, but weekly inspections for signs of breeding shouldn’t be one of them. …. This past month in particular has illuminated for me how much we define a woman’s value based on her marital and maternal status. The sheer amount of resources being spent right now by press trying to simply uncover whether or not I am pregnant (for the bajillionth time… but who’s counting) points to the perpetuation of this notion that women are somehow incomplete, unsuccessful, or unhappy if they’re not married with children. In this last boring news cycle about my personal life there have been mass shootings, wildfires, major decisions by the Supreme Court, an upcoming election, and any number of more newsworthy issues that ‘journalists’ could dedicate their resources towards. Here’s where I come out on this topic: we are complete with or without a mate, with or without a child. We get to decide for ourselves what is beautiful when it comes to our bodies. That decision is ours and ours alone. Let’s make that decision for ourselves and for the young women in this world who look to us as examples. Let’s make that decision consciously, outside of the tabloid noise. We don’t need to be married or mothers to be complete. We get to determine our own ‘happily ever after’ for ourselves. 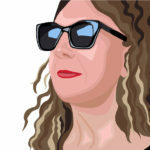 Read Aniston’s piece in full here. Gwyneth Paltrow’s Ego Can’t Even Let a Toddler Take Center Stage, and Is Choking Justin Bieber Art?